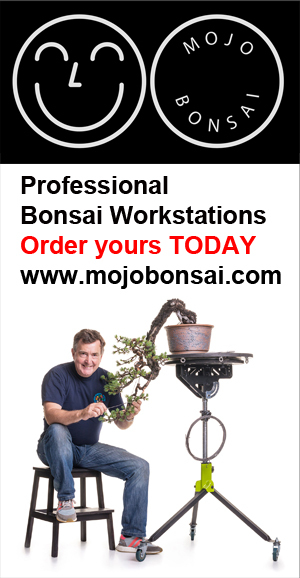 It’s so important that we make locally grown material for bonsai as we know that it will thrive in our climate and that we make provision for future generations of bonsai enthusiasts. I have been taking cuttings for over ten years, some take but many do not. I have a parent Itoigawa plant that I have used and have taken over 100 cuttings from this. Once the cutting have reached three growing seasons I introduce movement into the small trunks with copper wire, I also pot on into larger pots, usually shohin pots. After another three growing seasons they are ready to move on to larger pots and so continue. Some of the cutting are used to graft onto older junipers that are having their foliage changed. Another aspect of providing for future generations is (if suitable) I replace yamadori collected with a young tree of the same species into the place where I have dug. Here you can see some Yew saplings ready for that purpose.